Todd Stone Takes the Checkers at White Mountain! 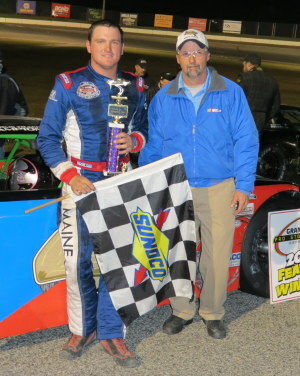 Woodstock, NH – Todd Stone of Middlebury, VT. took the checkers at the White Mountain 100 on Saturday night. In practice and the scuff sessions, veteran to the track, DJ Shaw of Center Conway, NH posted the fastest times. Wayne Helliwell Jr. of Dover, NH who has run well in the ACT Series posted some of the fastest times as well. 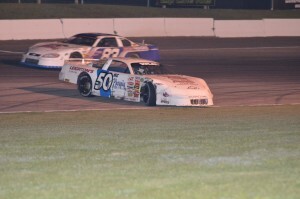 The feature saw Helliwell Jr. on the poll, and Luke Hinkley of Claremont, NH started on the outside to start the race. The early part of the race saw Helliwell take an early lead for the first twenty laps of the race. Eventually Shaw would take the lead and hold it until lap 40 when the caution flew. Shaw and Hinkley made contact on the backstretch sending the 31NH car up the pit road in a wild ride with the car ending up on thp of the pit wall, ending his night early. NORTH WOODSTOCK, NH – The Granite State Pro Stock Series will travel to White Mountain Motorsports Park, on August 1, for the WMMP 100. The WMMP 100 will be the eighth event of the 12-race season, and will be the second time the Granite State Pro Stock Series has visited the facility since the series’ inception. The following is a closer look at the numbers of the Granite State Pro Stock Series (GSPSS), and White Mountain Motorsports Park (WMMP). 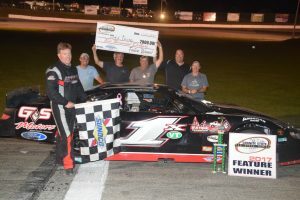 N. Woodstock, NH – Wayne Helliwell Jr. showed that it’s best to be lucky and good on Saturday night, winning the White Mountain 150 at White Mountain Motorsports Park. The American-Canadian Tour (ACT) point leader was running third when Brandon Atkins and Eddie MacDonald tangled racing for the lead on lap 115 of the 150-lap event. Dover, NH’s Helliwell inherited the lead and then pulled away from rival Joey Polewarczyk Jr. for his third win of the season and 10th of his ACT career. Waterbury, VT – The American-Canadian Tour (ACT) makes its annual visit to the White Mountain Motorsports Park in N. Woodstock, NH for the WMMP 150 on Saturday, June 20. The event will be the seventh on the Tour’s 13-race schedule and officially mark the halfway point of the 2015 season. As with ACT’s 23 previous visits to the 1/4-mile oval, many of the weekly White Mountain Late Model stars will take on the Tour’s best. Although there have been close calls, including former White Mountain Champion Travis Fadden’s third-place finish in 2014, the local drivers are still looking for their big breakthrough in a Tour event. 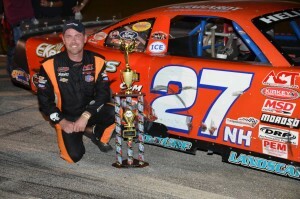 North Woodstock, NH- Brad Babb held off a hard charging Jeremy Davis in a caution-riddled event to pick up his second win of the season in the Fadden General Store 100 at White Mountain Motorsports Park (WMMP). The largest field of the year saw 32 cars fight to get into the inaugural Fadden General Store 100. After the inversion, Bobby Nadeau and Barry Gray led the field to green at the head of the 24 car pack to begin the race. 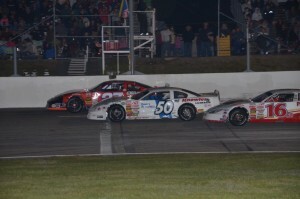 Gray would overtake Nadeau and lead the first few laps, before the first of 12 cautions came out for Nadeau, as the Buxton, Maine driver spun on lap 15. That would pit veteran against young-blood as Gray would see Babb on his outside on the restart. Babb took the lead on lap 16, and would fend off Gray’s multiple challenges on restarts, including a hard hit by 2012 champion Bobby Cabral head-on into the wall, until Jeremy Davis nabbed the second spot, setting up a good battle between two feature winners on the 2014 season. Davis and Babb had the cars to beat, as on every restart the two would rocket in front of the rest of the field, and at one point enjoyed a 10 car-length lead over the rest of the pack.